The Open Ruy Lopez gives Black free piece play and chances for the initiative. This sharp and interesting variation has been used by many of the all-time greats, including Anand, Kortschnoi, Botvinnik, Keres, Euwe, Fine and Reshevsky and this is by no means an exhaustive list. White will argue that Black loosens his position in the Open Variation, but if Black takes the time and trouble to learn the ideas and tactical themes that underpin this line, he has every chance to win the game. This will be especially interesting to the club player as it doubtless has been to the grandmasters mentioned above. 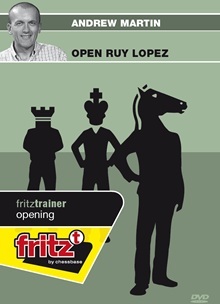 The Open Ruy Lopez remains popular in tournament and match play at all levels and in late 2010 this looks set to continue. It’s a rich opening variation which attracts players of every style. It’s also one of Black’s very best responses to the ‘Spanish torture’.